Hi everyone! I'm back again with another treat for you. 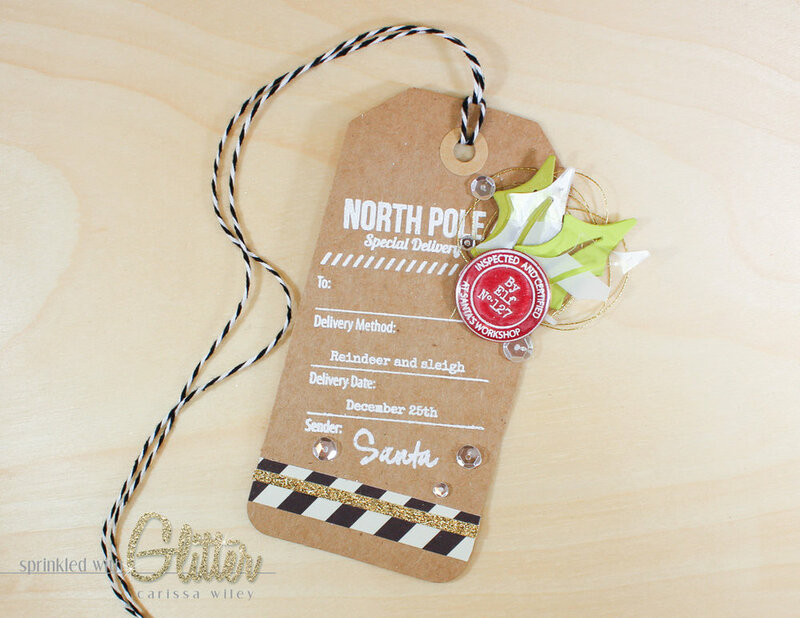 I've created another Christmas tag for The 25 Days Of Christmas Tags event. This time, I'll be featuring supplies from Ellen Hutson LLC, including some fabulous stamps from their exclusive Essentials By Ellen line. I'll be giving away the Santa's Flight stamp set and Poinsettia and Pine die set that I've featured in this project. Be sure to check out the details below. If you want more information on The 25 Days of Christmas Tags, be sure to visit Tracey's blog. This tag project is quick and easy and can easily be mass produced. I'm using a pre-made tag to make this project even quicker! The Santa's Flight stamp set and Poinsettia and Pine die set are fabulous...they don't need much embellishing. I've done some quick stamping and die cutting to create the main elements of this card. I started by heat embossing my focal image and elf seal of approval. I saved a little time by prepping both of my surfaces and inking up both of the stamps at the same time. Maybe it's genius, maybe laziness (maybe a bit of both). I used a super fine detail embossing powder on the images so that my words didn't turn in to blobs. And you can see in the photos that even the small words embossed beautifully. I found that the elf seal of approval works perfectly with a 1 inch circle punch! Score! This allowed me to quickly punch it out. I added a 1 inch epoxy dot over the top of it to make it feel more like an embellishment. It gives it shine and dimension. To create my holly leaves, I'm using the Poinsettia and Pine die set. To give these leaves a modern twist, I cut them in some bright greens as well as some We R Memory Keepers Clearly Bold striped acetate. When layered together, it gives a traditional holly leaf a fun and funky twist. I added some patterned paper and a small strip of gold glitter card stock to the bottom of the tag. This was a great way to bring a bit of pattern and sparkle to the card. It also balances the tag out because it creates another area of interest opposite the holly leaf cluster. To repeat the gold element toward the top of the tag, I added a messy nest of gold twine behind my holly leaf cluster. I attached this by adding a glue dot to the tag. Once I got my thread to the perfectly messy state I wanted it in (yes, I even want to control the disorder), I smooshed it on to the glue dot. This added some sparkle to the top of the tag. I attached the holly leaf cluster to the tag using some foam adhesive. This gave the tag just a bit of dimension and pop. Love these holly leaves! And I love that there are so many traditional feeling elements combined with some modern elements. I've created a video tutorial walking you through the creation of this quick and easy tag. You'll find that below. I've also linked all the products used in this project below. You'll find all these products at Ellen Hutson, LLC. I always get such wonderful customer service from them! So let's talk about that GIVEAWAY! Ellen is so generous, she's allowing me to give away the Santa's Flight stamp set and Poinsettia and Pine die set to one of my readers! In order to enter, you must use the Rafflecopter widget below. Entries will close at 11:59 PM PST on 12/30/2015. If you are under 18, please get your parents permission before entering. Good luck! Thanks for stopping by today! I really hope you enjoyed this quick and easy tag project! I had a great time creating this one. I hope you have a fantastic Thanksgiving as well. We all have so much to be thankful for! Until next time, I hope you have a fabulous day!